You’ll probably agree that Austin contains its fair share of 20-something hipsters, but we recently discovered two vandwellers who really have a good thing going: Christian and Aly Pickersgill. These lovebirds and vloggers are originally from San Francisco and have taken to calling themselves the Hipster Gypsies. In 2014, the Gypsies explored major cities in 25 U.S. states for four months in an effort to get out of their comfort zones and embrace the numerous opportunities for adventure and discovery that only seem to open up to those who are willing to let go of a certain measure of stability. Austin was, of course, one of their major stops along the Gypsies’ journey. “We travel in a high-tech 21′ RV named Tonto, sleep where we want, and make money when we can, without losing our souls,” reads the page description on the Gypsies’ Facebook. During their stay in and around Austin, the Hipster Gypsies inhaled smoothies and juice at JuiceLand and Daily Juice Cafe, got a nose piercing at Affinity Tattoo & Piercing, kayaked, made s’mores, and camped at Painted Sky Inn, stayed at Pecan Grove RV Park, and biked the Barton Creek Greenbelt. Christian and Aly smartly planned their trip to Austin to coincide with SXSW 2014, where they saw attended a free electronic music concert and drag show at The North Door featuring drag queen Christeene, got drinks at Cheer Up Charlie’s, attended a talk at Casa De Luz by blogger, lifestyle hacker, and RV dweller Tynan, and met Grumpy Cat, Aly’s “favorite obsession at the time,” at Buffalo Billiards. The Hipster Gypsies have arrived at #SXSW. HOPE Outdoor Gallery — aka. Castle Hill — also features prominently in the Gypsies’ coverage of ATX. The Gypsies posted plenty of photos of the 3-tiered street art gallery on their social media accounts, and during their short film “Spray,” included below, Aly paints a small Hipster Gypsies-themed mural on one of the fresh walls. Throughout their “World Tour,” the Hipster Gypsies made a habit of interviewing other like-minded vagabonds to get their perspectives on van and RV life — and of course, to nerd out about each others’ rigs. 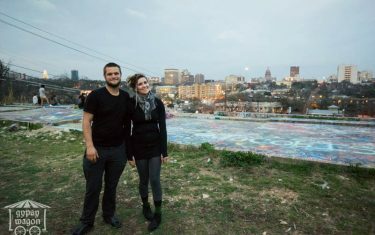 While exploring Austin, they connected with John Dukes, a kindly Austinite who lives out of his 2001 Chevy Astro van and 2005 Volkswagen Rialta RV. Dukes was first inspired to try the RV life after stumbling across Tynan’s writings, but like Aly and Christian, it took him some time to actually make the leap and start his adventure. Whether or not we go as far as selling most of our possessions and living out of an RV like the Gypsies, we think we can all surely find some wisdom in those words. And ultimately, we’re thrilled that the Gypsies came away with a high opinion of Austin — that’s what we like to hear! In fact, Aly confessed that she and Christian loved Austin so much that they may end up relocating here someday. All story photos courtesy of the Hipster Gypsies.